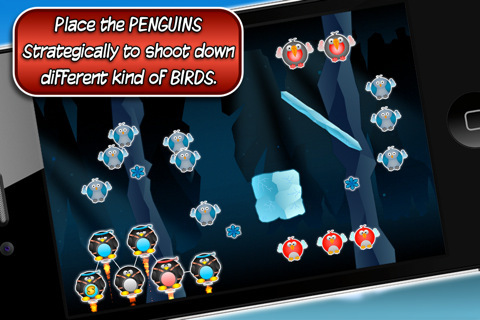 Mad penguins is a great head scratching puzzler game for the iPhone and iPod touch which requires that you drag your vengeful penguins into positions that ensures the launched snowballs take out the birds, and hopefully collect snowflakes along the way. The flightless penguins have become tired of being bullied by the birds and have strapped on their jet-packs to head out for revenge. The penguins are connected by straight lines, so you can’t just randomly place them where you please, and there are usually less penguins than target birds. Mad Penguins is something different for the iPhone, and if you enjoy a bit of a brain tease this is a must. The graphics are cute, and sufficient, though nothing exceptional, but that fits well with the non serious nature of the game. Controls are simple as you use your finger to align the penguins, but sometimes the placement can be a little imprecise especially near the edges of the screen, and the game would definitely benefit from the addition of multi-touch. There are three areas, each with 24 levels to complete. The level menu looks the same as most games of it’s type with the 3 star (snowflake in this case) formula, but it keeps it neat and uncomplicated so I see it as a plus. 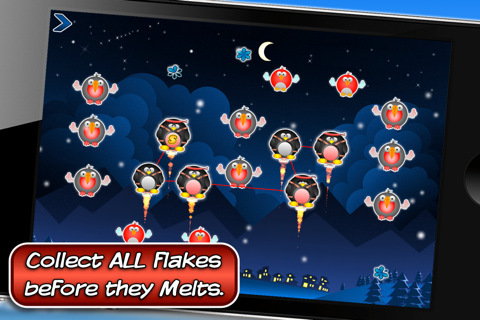 The snowflakes in the levels can disappear quite quickly, especially if you are having finger trouble, so you have to act fast to get them all. I was unable to find a way to share my results with friends, and didn’t see any game center integration either, and the game does have the feel that it is a new release that has room for improvement. The game is entertaining, and puzzling and for it’s low price tag of $0.99 I recommend that you get it. I like a game with a little more attention to graphic detail, so I’m going to be a little hard on it and rate it a little lower than some of the people that I polled for their opinion. As I mentioned before, the game has room for improvement, but if the developers do use that room well, this game can easily become a 5 star possibility. AppSafari review of Mad Penguins was written by Richard Best on August 8th, 2011 and categorized under App Store, Fun, Games, Puzzler, Strategy. Page viewed 3725 times, 1 so far today. Need help on using these apps? Please read the Help Page.